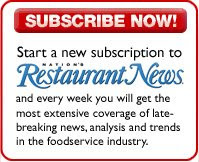 I’ve spent the past four days or so at two conferences thrown by Nation’s Restaurant News. The first was the Multi-Unit Foodservice Operators conference, better known as MUFSO (rhymes with STUFF-so, not GOOF-so). They’re terrific conferences where people who know a lot about what they’re talking about enlighten the audience with ways to run their businesses better. The conferences have to be great to get people to show up, but, like pretty much any convention, people really go to them to network. Where else can the owner of a fledgling grilled cheese sandwich chain pick the brains of the CEOs of Domino’s and Panera Bread? Where else can marketers responsible for naming new ice cream treats share ides with the head of culinary development for Baskin-Robbins? And where else can I hang out with the country’s corporate chefs and figure out the next thing that’s going to transform eating in America? Of course we had extended panel discussions on that topic for all to see, but one interesting fact emerged as I talked to these chefs between sessions: You know those kitchen workers at chain restaurant that no one thinks about? The ones who are occasionally mentioned as data points when calculating turnover, or the nameless mass for which restaurants must decide how much medical insurance they can afford? It turns out that many of them are really good cooks. Some of the corporate chefs charged with developing menu items at their chains’ headquarters told me that the cooks who have to actually prepare those items are being underutilized. Many of them cook at casual-dining chains for one shift and fine-dining restaurants for the next — and they say if you can successfully work the line during a lunch rush at Chili’s, you can jam during dinner at a white tablecloth establishment. One corporate chef at a big casual-dining chain said he thought the next frontier for his segment was unleashing the skills of their cooks. Not only would they make better food, but by handing more responsibility to their cooks they would improve morale in the kitchen and possibly clean up the foodservice industry’s reputation as a place loaded with dead-end jobs. Food for thought (sorry, but it is). There is no doubt that the popularity of food chains can be owed to the people who are working behind the delectable meals they offer. You created a great post with excellent information, i learnt a lot of stuff from this article.